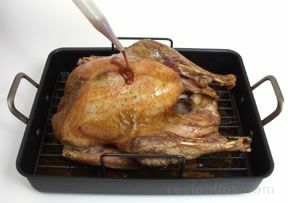 A piece of cooking equipment made large enough to hold a whole turkey in a pot of oil so it can be deep fried. 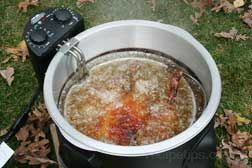 Consisting of a pot and a heating element that may use gas or electric for the heat, the typical Turkey Deep Fat Fryer is built to hold a turkey up to a 12 or 14 pounds in weight. The cooking time for poultry that weighs 12 to 14 pounds would be approximately 45 minutes. 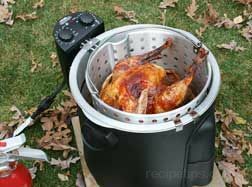 Generally, the Turkey Fryer will consist of an outer housing and heating element, an inner cooking pot, a perforated basket that fits into the cooking pot and a glass lid. The heating element is standard on all Fryers and may contain a heating control panel with adjustable heat limits or simply a minimal amount of heating options, either gas or electric. 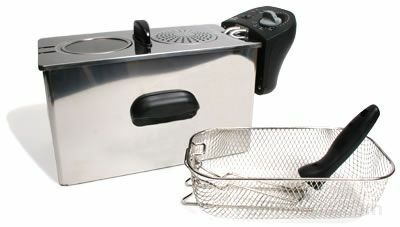 The inner pot holds the cooking oil and the perforated basket holds the turkey to make it easy to drop into the oil or remove from the oil when finished cooking. 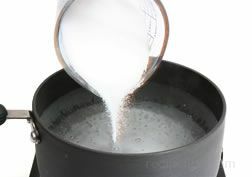 The cooking pot may have a spigot or valve that allows the oil to be drained into a container when the cooking process is finished and while the oil is still fluid. The glass lid enables the cooking progress to be viewable. 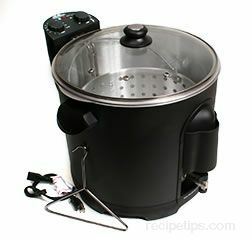 In addition to whole turkeys, the Turkey Deep Fat Fryer can be used to fry a wide variety of foods such as poultry, vegetables and other commonly fried foods.